Our guests consistently say we have exceeded their expectations! After the Northern Italy tour this was our second time traveling with Tour With Us. 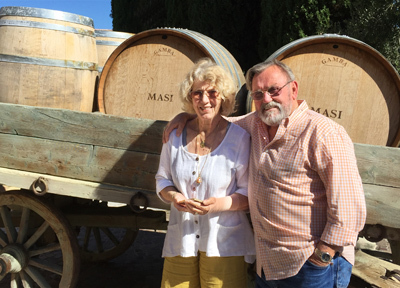 Our trip to SICILY with Stefano and Perla Landini was everything we could have asked for! Incredible historical sites and delicious food all made for wonderful memories to carry home. Every evening while the ladies enjoyed gelato and the men sipped grappa, we talked about what the next day would hold in the way of another adventure – the beautiful AMALFI COAST, huge Amalfi lemons (the best ever! 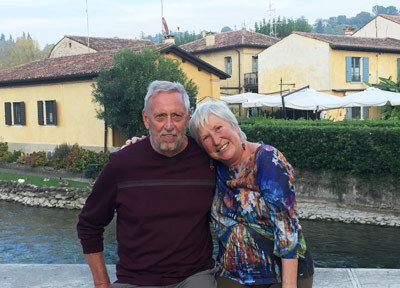 ), Mount Etna, incredible mosaics, breathtaking cathedrals, POMPEI, cooking with a Sicilian mama and dinner with the family, chocolate, salt from the sea, ceramics, papyrus making – all under the watchful eye of Perla and Stefano. The only regret was not leaving enough room in my suitcase for a pair of very blingy tennis shoes that all Sicilian women seemed to be wearing! Thanks to Perla’s tutoring we were able to understand a fair amount of what we heard. My favorite as we headed off to bed each night was saying “Sogni doro” (sweet dreams). 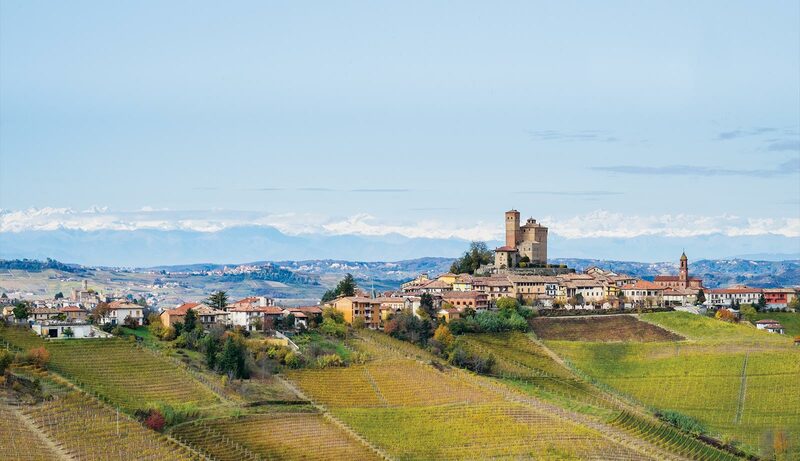 We have no reservations whatsoever about recommending Tour With Us for a unique and exciting trip to Italy. We recently returned from our 24 day trip to SICILY and the AMALFI COAST. The trip exceeded all of our expectations! Perla and Stefano were extremely attentive and organized. We initially chose to travel with Stefano and Perla because we liked the idea of a small tour group of six people, the other couple being our good friends and travel buddies. They were open and more than willing to adjust the original Sicily itinerary to include the towns where my Sicilian great-grandparents were born. We also extended our tour to the Amalfi coast in order to also visit the towns outside Naples where my two other Italian great grandparents were born. Stefano and Perla invested a lot of their time pre-planning our customized trip and getting to know us before our trip. They provided a fun and stress free vacation where they took care of everything. Every day was a sensory delight. 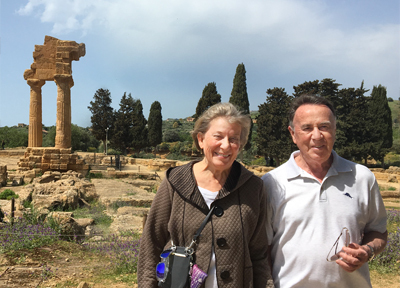 We experienced a variety of excursions including local tour guides at archeological sites and medieval towns; wine, mozzerella, and chocolate tasting; delicious meals; and one of our favorites…learning to cook Sicilian specialties in the home of a lovely family outside of Modica. We also appreciated Stefano’s driving abilities through the entire trip but especially in Palermo and the Amalfi coast and Perla’s historical accounts and willingness to taste test gelato with us almost everyday! 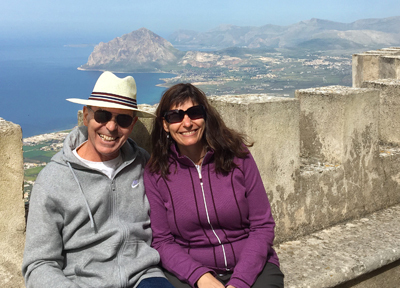 The Amalfi coast was beautiful and we are so happy that we experienced it with Stefano and Perla. We feel that our trip had a unique personal touch and are so grateful to both Stefano and Perla for an incredible three weeks in Sicily and Italy! 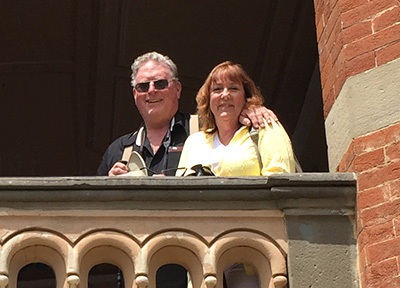 My husband and I were very fortunate to spend 10 days in TUSCANY with "Tour With Us". Stefano and his lovely wife Perla provided a wonderful adventure that we truly could not have experienced without them. Stefano’s intimate knowledge of the region and his attention to detail made every aspect of travel in a foreign land easy and inviting. We never had to worry about anything during the tour as every detail was thoughtfully planned for and graciously carried out. The meals, the hotels and the towns we visited were all a delight. And Stefano and Perla are both so caring and gracious that spending time with them made the trip that much more enjoyable. We can’t thank them enough for the wonderful memories that will last a lifetime. Tuscany is a very beautiful area - and they represented it well. We would not hesitate to take another trip with “Tour With Us”. In fact, we can’t wait for the next opportunity! 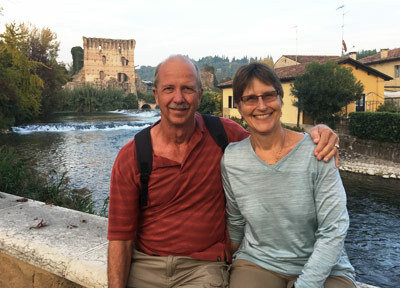 We have traveled in Europe or Asia for each of the past 25 years and can enthusiastically aver that is the best trip of our lives. 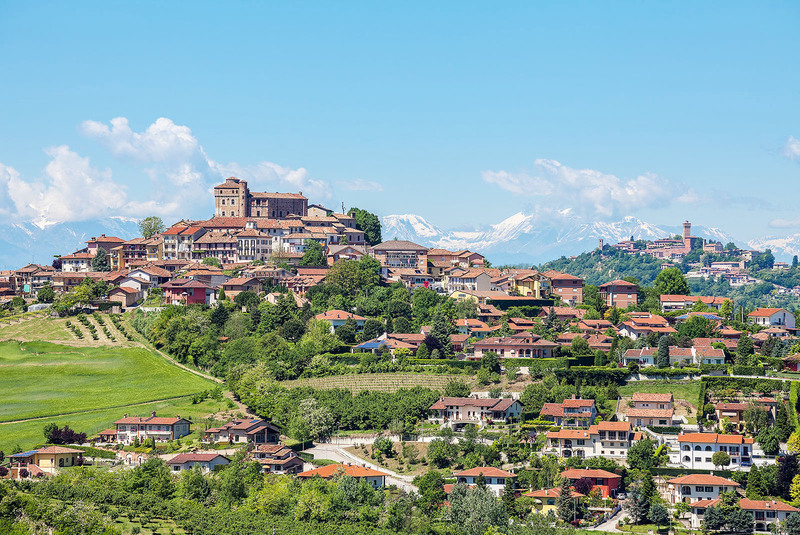 Everyday held surprises as we spent 24 days intimately immersed in the delights of NORTHERN ITALY. We could go on but is obvious to us that our tireless, inspiring hosts, Stefano and Perla, are what made this trip exceptional. The scope of their knowledge, their connections, their wise choices, their dedication, warmth and humor provided the catalyst for this magical adventure. We want to say that our trip was all that we have hoped it to be plus a whole lot more! It was so wonderful to get to experience Italy with the both of you as our guides. Thank you for the TLC offered to all of us. We feel the group was a cohesive and everyone so pleasant to spend so much time with. 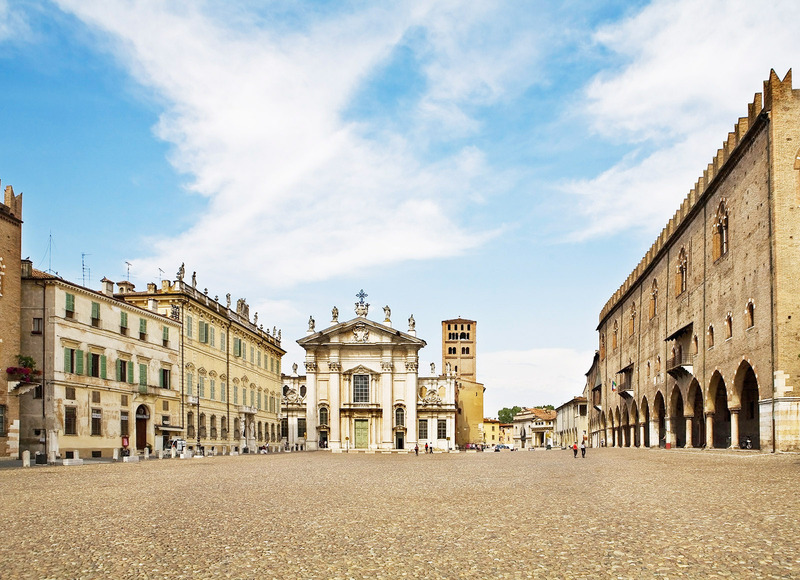 We fell in love with Italy and want to learn more about the culture of the lovely ancient land and people. We’ve a book on the history of VENICE that we skimmed before the trip but we are now reading it with a bit more insight having been there. It’s fascinating! Martha made the Farina Mista polenta for a family dinner party last night...delicious! Don’t forget to write the recipe for making gnocchi for us. We have just returned home from the most wonderful vacation. 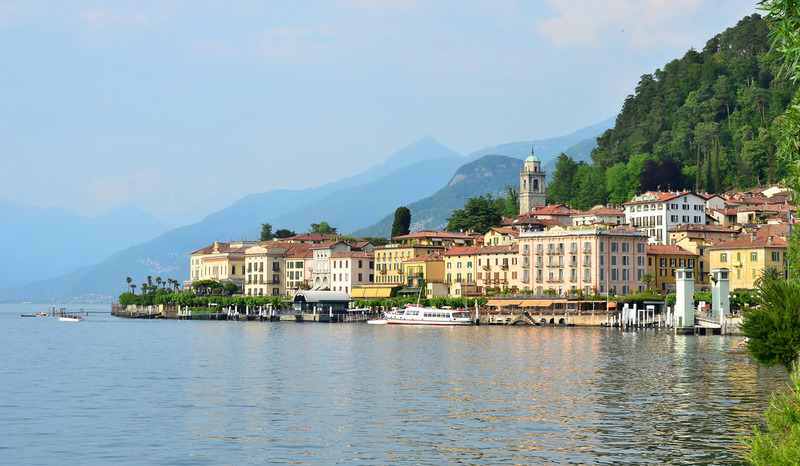 We spent 24 days in NORTHERN ITALY on an adventure of a life time with Tour With Us. 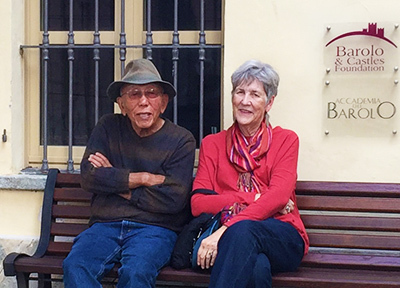 Our hosts and guides, Stefano and Perla, made the trip all the more special. Stefano being a native of the area was able to treat us to places and tastes that most travels never get to experience. Everything was seamless from our arrival in MILAN, to our road trips to rural farms and vineyards, to our canal ride to VENICE. We were filled with Italian food and wine, art, history, beautiful scenery, and the opportunity to share with the people in the local communities. We had local guides to enrich the depth of our experiences, and I feel like we saw and tasted deeply a small region of Italy, We cannot say enough how grateful we are to Stefano for this experience, and we can recommend this trip wholeheartedly and without hesitation. This trip was truly unique and it was very good value. We look forward to returning to Italy again and hope that we can join with Stefano on another grand adventure. 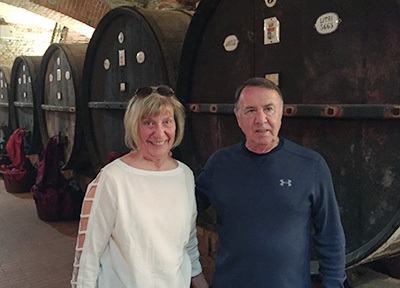 Last October, my husband Al and I had a wonderful experience with Stefano in his “Tour With Us” trip to NORTHERN ITALY. I can’t say enough good things about the trip. From the time he met us at the Milano train station, to when he delivered us to our hotel in Milano at the end of the trip, we were pampered, well attended, and well “wined and dined”. 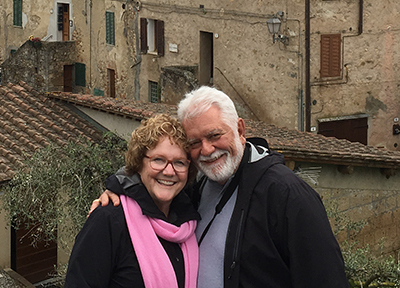 We have made several trips to Italy —on our own and with other groups, but it was a true pleasure to take this kind of small tour with native born tour guide who is totally familiar with the areas he revealed to us. He also added local guides to give us a more complete historical picture of the wonderful places we visited. As a former History teacher, I do appreciate that. The more I can learn about the history, traditions and culture of the places I visit, the happier I am. Stefano made sure we experienced as much as we could in the time that we had. It is always good to visit the big Italian cities, but it is equally good to see Italy up close and personal. 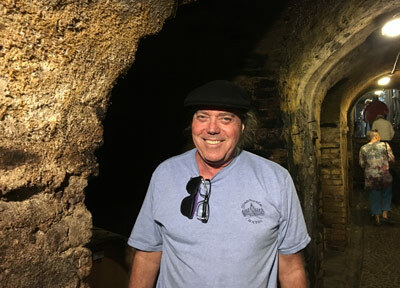 I highly recommend Stefano and “Tour With Us” for a fabulous experience. 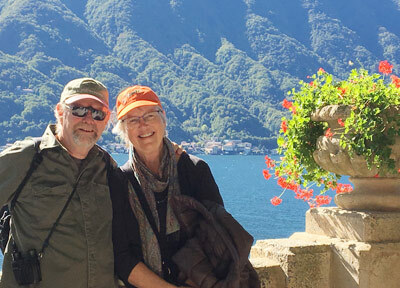 Last fall my husband and I had the extreme good fortune of traveling with Stefano to NORTHERN ITALY. It was a trip beyond all of our expectations. We could not have asked for a better person to show us Italy. We saw an Italy that we could never have seen or experienced on our own.... lovely, small hotels, fabulous dining experiences with delicious foods and wines of the region, visits to local farms, wineries , sites with interesting attractions in towns off the beaten track......all adding up to an unforgettable lifetime experience. Traveling with a small group is a huge plus, especially with someone as knowledgeable, kind, considerate and caring as Stefano. 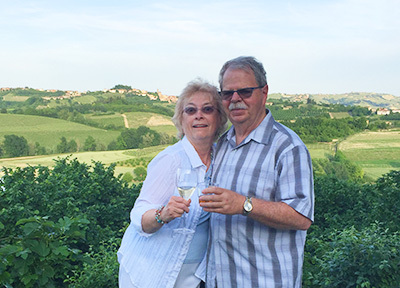 My husband and I would not think twice about recommending " Tour With Us" to anyone who wanted to go to any part of Italy and have an unparalleled experience. My husband and I have traveled to many places and taken many tours, but this is by far the best tour we have taken, for several reasons. First: It was a small group, and everyone got to know each other. We laughed and had such a good time with everyone. Because it was a small group, we went to places where other tours would never be able to go. Next: Stefano took such good care of us. It didn’t matter that very few people spoke English. He made sure we understood everything and went out of their way to accommodate all of our needs. Next: The food . Oh my, the food! Our first meal was pizza. I had the most amazing Frutti di Mare. It was beautiful to see, as well as to eat. It didn’t have any cheese and yet it was marvelous. 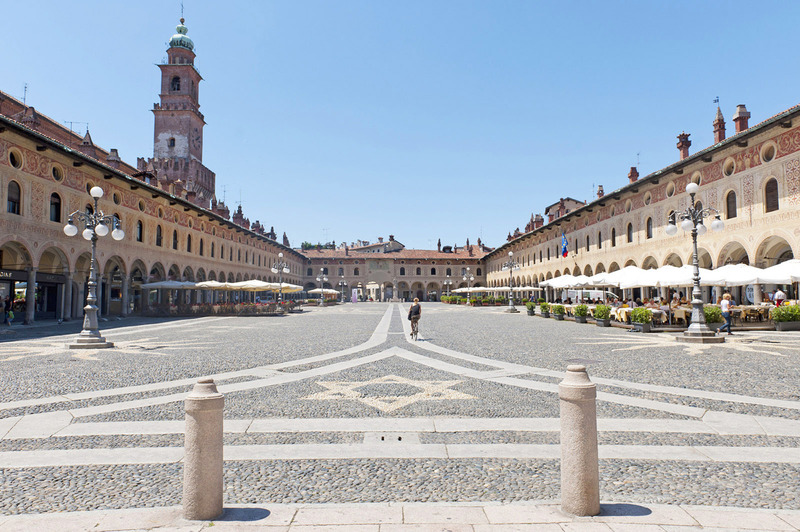 Then we had lunch in Mantova. Instead of choosing things off the menu, you selected for us and we all shared. I was a little dubious abut this at first, but we ate things we would never have selected: cooked salami, pasta with donkey sauce, lard with herbs! It was so delicious and each meal just kept getting better. We ate at small restaurants or people’s homes in tiny towns and got to taste the specialties of the local areas. Since I couldn’t eat dairy, you were so thoughtful to be sure that I was able to eat foods that were dairy free. Other tours we have been on were very skimpy with the food and we had to pay for drinks. Not only was everything included here, you never made us feel like we were eating or drinking too much or too pricy. Next: The tours. We didn’t feel like a number being led through yet another tour, like happens in larger cities and larger tours. People were very friendly and I got the feeling that in many cases they didn’t have visitors very often, so were very welcoming and friendly and wanted to show us everything – like the sheep farm, the hazelnut farm and Gianni’s WWF farm and vineyard. Each place they prepared a home cooked meal that was so delicious. We really liked that. We didn’t visit lots of museums and churches, just a few and they were very lovely. Since we are not big museum people, it was just the right amount. We visited lots of wineries. We learned something new at each place, like the “mother” needed to start the fermentation process. We especially like the BBQ at Stefano’s uncle’s home. I really enjoyed making gnocchi, and the rest of the food was great. Even though the people at the party didn’t speak English, we enjoyed being part of an Italian party, with all the singing and happy people. Next: The places we stayed. I am so glad we added the additional 2 days in Sirmione. What a beautiful introduction to the trip. They even had fireworks for us on the first night!! Belagio was also so beautiful. The visit to Villa Balbianello was very interesting. So was the garden at Villa Carlotta. Your alternate plans were also very nice, and a good idea to have. 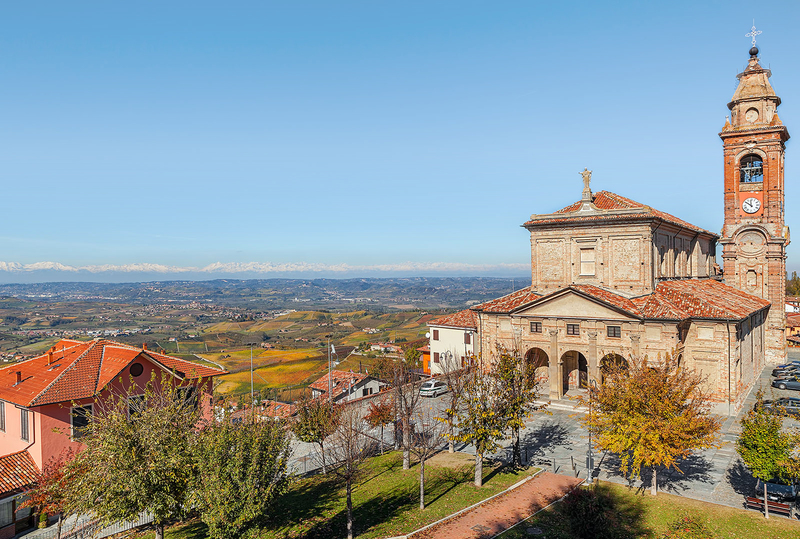 Our last place was centrally located in order to see all the places in Langhe, and a very nice hotel. General comments: Thank you Stefano for this wonderful experience. I could go on and on about all the wonderful places we saw and the great food we ate, especially the last night’s magnificent dinner. I know not everyone wanted the cooking lessons, but I loved them. The gnocchi class was so much fun. I can’t wait to make my own gnocchi and pastas. Every day, as the memories sink in and begin to become concrete, I remember so many amazing things that when friends ask about the trip, I can’t summarize it, and they probably want me to be quiet. My over the top enthusiasm for “Tour With Us” already has me recruiting potential travelers for Tuscany. I can’t thank all of you enough for being part of this amazing experience with us. And, a really, really special shout out for Stefano who made the trip. Period. I tell everyone that we could never, ever have had this kind of experience without you. You found remarkable, out-of-the-way places that will be memories for me forever. I didn’t write down all the names of the restaurants, so I can’t remember all of them, but I plan to do a timeline so I can fill in the blanks. There’s no way I can pick one thing as my favorite. It was just that remarkable. 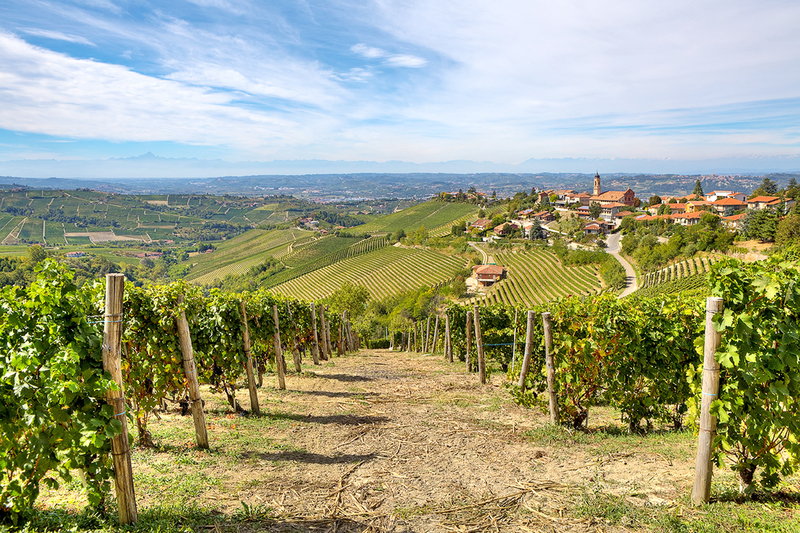 The trip to NORTHERN ITALY with Stefano exceeded all our expectations! Jim tells friends that we didn't have one bad meal or glass of wine. We enjoyed delicious and local meals too numerous to mention here... pizza with good wine poured from a copper pitcher, pasta outside after a lesson in cheesemaking, homecooked meal at the family table of hazelnut farmers, gnocchi-making and accordians at the home of an uncle, and a farewell dinner at a 5-star restaurant in a castle. So much beautiful scenery and history to soak up. Jim and I knew very few words in Italian, but not to worry because our guide took care of EVERYTHING. Grazie Stefano!